This battery can be found on the northern most point of the Lista peninsula. It was armed with two 10.5cm K332 (f) first placed in open emplacements and later transferred to 671s. One gun still exists and gives a great view of how a casemate once looked like. An interesting Sk Leitstand lies in between and was built into the rocks. Unfortunately access to the tunnelsystem has been blocked in recent years. Several small positions can be recognized near the coast. It's quite a walk but the views are excellent again! 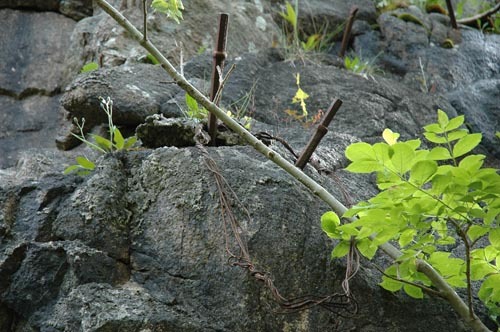 Steel bars with remains of camouflage nets in the rocks above the 671s.